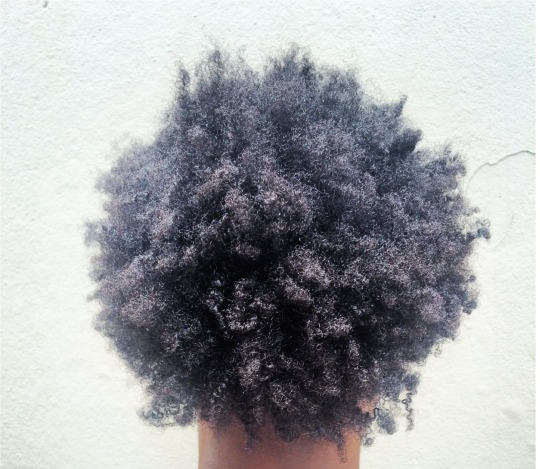 Very often, intentionally or not, natural hair blogs can feed into the hype of hair typing. The blogger raves about whichever newest and latest products claim to ‘define your curls’, ‘eliminate shrinkage’ or ‘loosen your kinks’. And if you’re a new natural (or even just a compulsive buyer) you run right out and pick up every custard, cream and soufflé gel because you believe you need them. I’m speaking from experience because I still have a draw full of products that do absolutely nothing for my hair. There’s no wonder the natural hair care market is projected to be worth $761 million by 2017. I love trying new products, in fact nothing excites me more than walking into the beauty supply store and looking at the endless options. How comfortable are you wearing your naked fro? No custards, styling balms or gels just your hair in its natural state, moisturized but not necessarily ‘defined’. Like makeup, I never want to rely on an assortment of products to feel beautiful or acceptable. Our hair is magic, even when it’s naked! We shouldn’t feel obligated to change or manipulate our hair into something it is not to fit into the natural hair spectrum. Thank you for pointing this out. You wrote it exceptionally well too. Great post.